Tetsuya Kuroko doesn’t stand out much. In fact, he’s so plain that people hardly ever notice when he’s around. Though he’s just as unremarkable on the basketball court, that’s where his plainness gives him an unexpected edge—one that lets him execute awesome moves without others noticing! Seirin’s fighting an uphill battle against Murasakibara and Himuro of Yosen. But a bit of inspiration from Kise helps Kagami get in the zone! Meanwhile, Himuro’s encouragement finally convinces Murasakibara to take the game seriously! The quarterfinal match between Seirin and Yosen is about to be decided! Tadatoshi Fujimaki was born on June 9, 1982, in Tokyo. 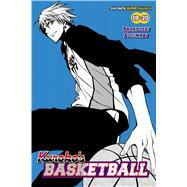 He made his debut in 2007 in Akamaru Jump with Kuroko's Basketball, which was later serialized in Weekly Shonen Jump. Kuroko's Basketball quickly gained popularity and became an anime in Japan in 2012.